If there was a checklist for the perfect travel destination, South Africa would tick most of the boxes. Famed for its amazing wildlife and landscapes, superb local cuisine, warm hospitality and great weather, it’s easy to understand why tourism is so big in South Africa. 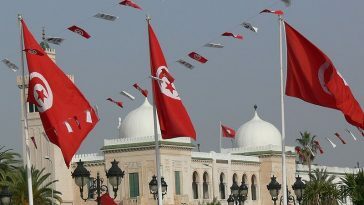 With an average of 15 million visitors flocking to the country every year, the allure is strong. Nestled between a rugged mountain range and the Atlantic Ocean, Cape Town is one of the most beautiful cities in the world. 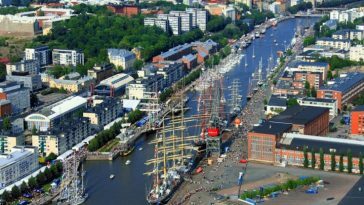 It’s also one of the most popular tourist destinations in all of Africa. This multicultural city enjoys a superb natural setting, pristine beaches, sophisticated infrastructure and a mild, Mediterranean climate. A few city and peninsula headline acts include Table Mountain and Lion’s Head (the most iconic landmark in South Africa), the magnificent Kirstenbosch Botanical Gardens, Boulders Beach for penguins that waddle along golden beaches in and amongst holidaymakers, the Victoria & Alfred Waterfront, the famous Robben Island (where Nelson Mandela and other political prisoners were imprisoned during the apartheid years) and Cape Point. And there is no shortage of world-class trendy restaurants and a vibrant nightlife for all tastes. It’s no wonder that Cape Town is the crown jewel of the country. 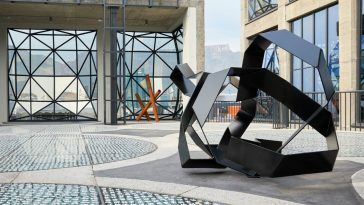 For the active traveller, the Cape Town peninsula is a treasure trove of hiking and mountain biking trails, kayaking and wind-surfing spots – in fact just about every physical outdoor pursuit is catered for within a relatively short radius of the city. South Africa is famous for its award-winning wines, and some of the best wine in the country comes from the scenic rural outskirts within a short drive of the city – including Stellenbosch, Franschhoek, Constantia and Robertson. Set against a picturesque mountain backdrop the Cape Winelands are among the most scenic in the world and feature many historic wine estates that date back centuries. The area is also home to charming boutiques, gourmet restaurants and five-star hotels. A drive through South Africa’s wine country is well worth the trip – especially if you’re not the ‘designated driver’! South Africa’s iconic national park and one of Africa’s conservation success stories, the Kruger National Park is a must-do safari for any bush lover and for those keen on ticking off the Big 5 (lion, leopard, rhino, elephant and buffalo) in a relatively short space of time. The park and adjoining private reserves (Sabi Sand, Timbavati, Klaserie, Umbabat and Balule) that share its unfenced western border make up about 22 million hectares (22,000km²) of varied bushveld with six ecosystem types, and are collectively referred to as the Greater Kruger National Park. Kruger’s vast size and variety of ecosystems results in a wide diversity of wildlife (including over 500 bird species) and some of the finest game-viewing in Africa. In terms of wildlife, the sheer number and diversity of wildlife is almost unparalleled, making this the perfect place to spot the Big 5 and much more while out on a game drive, or even a guided walking safari. While Kruger National Park receives over 1.4 million visitors a year, you’d be surprised at how often you find yourself alone in the vast open spaces, giving you a truly authentic African wilderness experience. 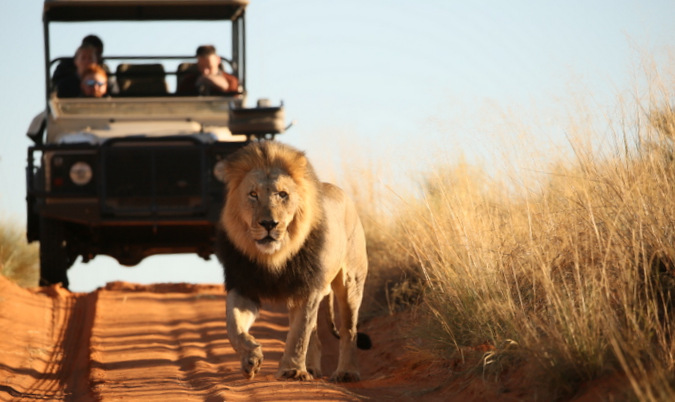 The national park offers self-drive options and affordable self-catering accommodation options, but there are also areas within the park boundaries set aside for the exclusive use of private lodges, and together with the adjoining private reserves to the west of the park, these private lodges guarantee exclusivity, low visitor numbers and sensational game viewing – where sightings of the Big 5 are almost a daily occurrence. 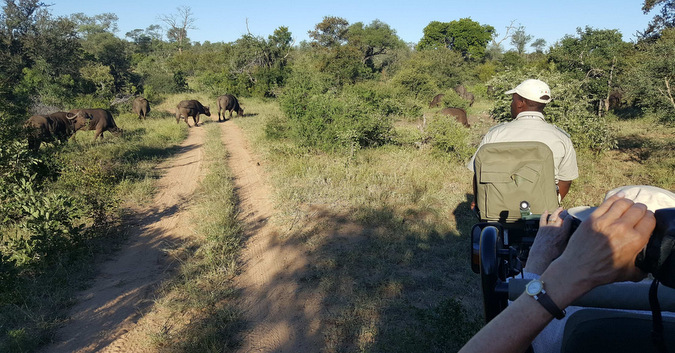 A safari in the Greater Kruger National Park is a must for first timers and is also very popular with experienced bush-goers who go back year after year. The malaria-free 75,000 hectare (750 km²) Madikwe Game Reserve in northern South Africa, close to the Botswana border, is favoured by those who want a Big 5 safari, but without the crowds sometimes associated with larger, more popular reserves. Madikwe does not permit day trippers or self-drive game drives, ensuring a private safari experience. The dry Kalahari ecosystem offers an alternative to the Lowveld bush seen in the Kruger National Park, and so Madikwe offers some unique and exhilarating safari game viewing and photographic opportunities. Aside from the Big 5 species, Madikwe offers the chance to see wild dogs, cheetahs, brown hyenas and large numbers of plains game – and about 360 species of birds. The absence of malaria plus easy access from Johannesburg via road and air makes Madikwe an excellent choice for family safaris, and some lodges even cater for children-friendly activities. The range of accommodation, from luxury to basic, means that there is something for everyone. Madikwe is something of a success story for wildlife conservation, local community economic empowerment and private/public enterprise. The land and animals are managed by the state, private investors profit from the lodges, and three nearby villages benefit via sustainable jobs and skills advancement. Sandwiched between vibrant Cape Town and the malaria-free Cape Game Reserves – are the idyllic Garden Route and Little (Klein) Karoo, together offering an unrivalled mix of experiences and adventures within a proverbial stone’s throw of each other. The Garden Route offers a laid-back and intoxicating blend of beaches, lagoons, craggy mountains and ancient indigenous forests. 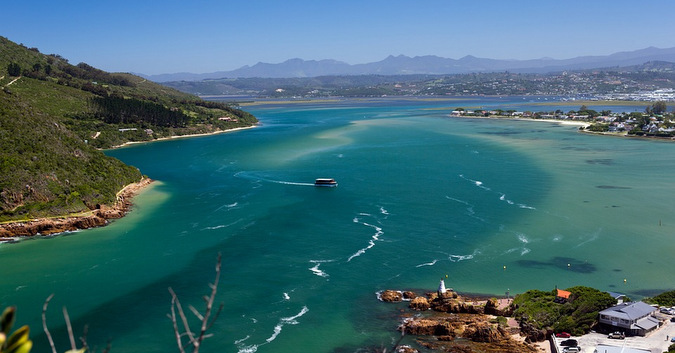 Gorgeous historical coastal towns such as Knysna, Plettenberg Bay and Nature’s Valley offer a range of accommodations to suit every need, and the many smaller rural villages along the way each offer an authentic charm. While the spectacular landscape is enough to leave you awestruck, it’s worth exploring the many hidden nooks and crannies, where some of the true gems lie. Expect to unearth artist communities, wood cutter clans, fishing communities and many visitors who arrived on holiday and have never left this forested coastal paradise. Whether you’re into rambling through art and craft markets, zip-lining through forest canopies, chilling on golden beaches or relaxing at a health spa, the Garden Route has it all in spades. You will be seduced by this charming haven and emerge relaxed and ready to resume your real life. The Little Karoo lies inland of the lush Garden Route, just across craggy mountains that themselves harbor many wild and secret places. The dry semi-desert Karoo is a place of historical ostrich farms, olive groves, wine, the famous Route 62 and adorable habituated meerkats. The northern coastline and bushveld of KwaZulu-Natal hosts one of the most diverse habitat matrices, endemic species strongholds, successful conservation projects and enthralling Big 5 safaris in Africa. And to top it all off, there are a wealth of cultural and ecotourism activities, miles and miles of sandy beaches with warm water and, for some reason, relatively few tourists. Zululand and the Elephant Coast, where black and white rhinos recovered from almost going extinct, plays home to the mighty Zulu warrior and to iSimangaliso Wetland Park – Africa’s oldest protected area and South Africa’s first World Heritage Site. This is also the home of other renowned protected areas such as Hluhluwe-iMfolozi, uMkhuze, Ndumo and Thembe, offering a wide array of habitats such as woodlands, wetlands, palm savannas and coastal forests. And amongst this vast network of protected areas are private game reserves such as Phinda, Pongola, Zululand Rhino and Zimanga, which offer luxury safaris to our discerning guests, with exceptional sightings of big cats, rhinos and elephants in addition to a host of other species. For the avid birder, KwaZulu-Natal is not only a haven for colourful endemics, it also offers the best birding infrastructure in South Africa. 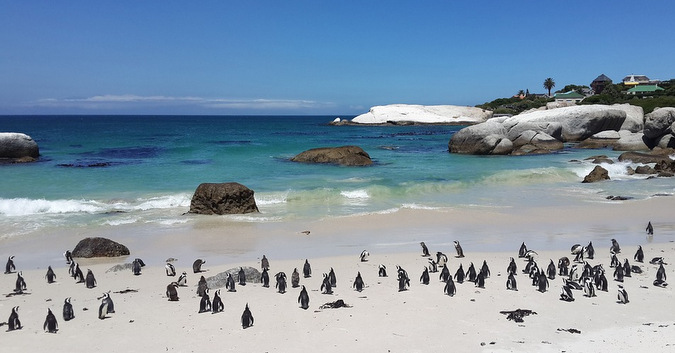 The adventurous can expect exciting walking safaris and a stunning coastline bathed in warm water and offering the best scuba in South Africa – with coral reefs, whale sharks, dolphins and breeding turtles. For the history buffs, the battlefields of KwaZulu-Natal were the anvil that forged South Africa’s political past. The famous battlefields of Isandlwana, Blood River and Spionkop witnessed fierce clashes between British forces, Zulu warriors and ‘Boer’ soldiers. 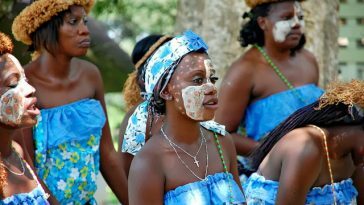 So, if a combination of bush, beach and history is your thing, visit KwaZulu-Natal. For those seeking a malaria-free bush break closer to Cape Town than the traditional bushveld destinations, the Cape Game Reserves have much to offer, even for Big 5 fans. 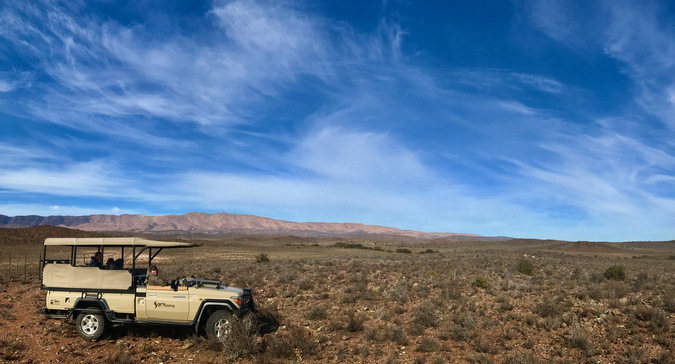 Expect a range of dry bushveld types, from the vast and arid plains and mountains of the Great Karoo to the succulent Klein Karoo and the dense valley thickets of the Eastern Cape. You will even see big game in mountainous Cape fynbos habitat, in amongst the proteas and ericas. Some Eastern Cape reserves even offer boat trips down winding rivers for a day at the nearby idyllic beaches for that classic bush/beach combo. Most Cape rural areas have been historically farmed, and many of the private and even government reserves are reclaimed farmland – a great success for conservation. Purists might prefer the classic upcountry game reserves of Kruger National Park, Madikwe Game Reserve, KwaZulu-Natal or the Kalahari – but others enjoy the proximity to Cape Town for their bush break. The vast malaria-free Kalahari offers a true desert safari experience – with endless vistas of red dunes and grass savannahs dotted with massive gnarled camelthorn trees, and the desert-adapted species that thrive here. This unique ecosystem hosts a remarkable population of arid-specialist species, including the rare desert-adapted black rhino, Kalahari lions, cheetahs, wild dogs, springbok, oryx (gemsbok) and sought-after smaller species such as aardvark, honey badger, brown hyena, pangolin and aardwolf. There are also a few habituated colonies of meerkats that provide excellent photographic opportunities. The absence of malaria makes the Kalahari an excellent choice for family safaris.